Recently we had a tad of rain, really a drizzle. Believe me, this is a big event in Southern California. I grabbed my trusty point and shoot and went in the backyard and got some great close-ups of the rain drops on my plants. This photo shows some rain drops on rose leaves. Straight Out Of the Camera! Your raindrops are beautiful!!!! Awesome shot! Take Care!! 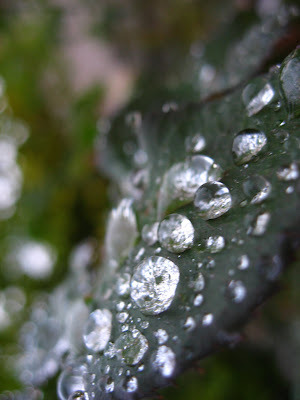 Nice shot of water droplets, Jan. Good eye! I think it's amazing what a point and shoot can do. That's what I use a lot of the time, especially if I'm hiking...or in cold weather when I want to keep my camera warm under my coat.